Welcome to 2018! Have you made any New Year’s resolutions yet? Once you reach a certain age, and have given up on enough New Year’s resolutions, you may not put much stock in the whole idea of making resolutions at the start of the year. But resolutions (or goals if you prefer) can actually be pretty powerful, if you make them right. Take a look below at my tips on how to Start the Year off Right with a New Year’s Resolution Worksheet! I think the problem with most New Year’s resolutions or goals is that they’re either too vague or too huge. Too vague is saying something like “I’m going to lose weight this year!” You could literally succeed at that by losing a single pound. And other resolutions are things that are virtually impossible to complete in a year without a lot of luck, like saying “This is the year I become a YouTube star!” Obviously you could start a YouTube channel and become a star within a span of 12 months, but that’s really not how it happens for most people, setting that resolution up for failure. From my experience, a better way to make your New Year’s resolution is to make several small resolutions! This year I’m going to make mine based around certain ideas: things that I want to learn, things I already know but want to improve at, things I want to make more time for, places/people I want to visit, activities that I want to continue, habits that I want to stop, and habits that I want to start. Let’s go over each of these ideas to help you figure out what your resolutions are! This section of your New Year’s resolution worksheet is pretty easy. What new thing do you want to learn in the New Year? I suggest that this section be an actual skill (painting, piano playing, etc.) or subject (French, astronomy, etc). Something measurable, so you’ll know at the end of the year if you really improved. If you wanted to learn a trait, like humility, for example, I would put that under the next section. This improvement section is pretty open. It can be to improve at a skill/subject that you already partly know, or as mentioned, a personality trait. Your resolution for this section should either be about a person, pet, or thing. When it comes to people, yourself counts! There’s nothing wrong with setting aside some time each day for yourself for a mental health refresh. Or maybe you haven’t been spending enough time with your significant other, or your friends. Now’s the time to analyze your relationships and see if anyone might enjoy more time with you! This section could also refer to spending more time on a thing, like a creative project, organizing or business. Maybe you’d like to spend more time on a book you’ve been writing or a blog you’ve been building. Despite how success stories sound in the news, most success doesn’t just happen randomly and suddenly. It’s the result of spending time working hard on something every day. This section should either be about a person or a place. Even if you chat all the time on the phone with your family, there’s still nothing like being face to face in the same room. So see if you can plan a trip to visit them this year, for a holiday or just a fun family weekend! Or maybe you’d love to see the world. This could be the year you finally take your big trip! Start doing research now on how much it’d cost to travel to your destination, and see if you can save up for it in the coming months. It may actually cost less than you think! This part of the worksheet kind of encourages you to brag about yourself as a way to keep you motivated to continue a good habit/action. What good thing have you been doing for the last 12 months? You may write in something like, “I will continue to work on my acrylic painting skills,” or “I will continue to listen more than I speak,” or whatever you were already successfully working on. 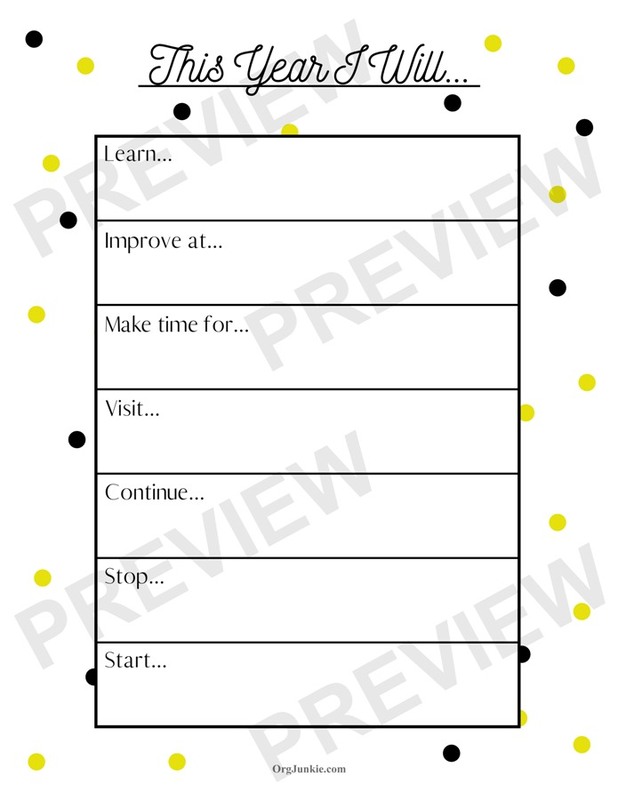 If you use this New Year’s resolution worksheet for two years in a row, the things you put in under the “learn” or “improve at” section may find their way here the following year. Use this part of your New Year’s resolution worksheet to make note of a bad habit or trait that you have that you’d like to stop. Smoking is an obvious habit to stop, along with nail biting. You may also want to stop a bad trait/action, like interrupting people when they’re speaking. Think about it this way, if you were someone else, what would you tell yourself to stop doing because it was bad/annoying? Finally, use this section to right down a good habit you’d like to start. Maybe you want to remember to hold doors open for people. Or maybe you want to eat healthier. What good habit would you be proud to have developed by the end of the year? Once you’ve completed your New Year’s resolution worksheet, you’ll have 7 manageable and measurable resolutions, setting you up for success (with way less overwhelm) in the new year, whoot! Do you normally make New Year’s resolutions or goals? I can share mine in an upcoming post if you’d like. I love this, especially “I will continue…” It doesn’t have to be about bad habits! Yes exactly, focusing on the negative is really draining and not very productive I find. I appreciate the variety of actions that can bring positive results! I want to learn how to create a Prezzi presentation & use it at a speaking event! !